Increased sales and boosted productivity at Spark New Zealand, thanks to ArcGIS Online and Eagle Technology. "A major plus for us is that we didn’t have to involve our internal IT team or, other than purchasing iPads for the field teams, add much infrastructure. ArcGIS Online is cloud-based which means we don’t have to worry about software installation or upgrades, scaling up or down or any support issues." In New Zealand, competition on providing broadband internet access to consumers and businesses is intense. The major telecommunications companies are all looking for ways to increase their market share and improve customer satisfaction. Spark New Zealand, NZ’s leading telecommunications company, as part of their ongoing sales process, has been using teams of D2D sales people to call in at households across the country to promote Spark’s broadband offerings. But, unfortunately, the results were less than anticipated. The answer was ArcGIS Online. Spark has developed an iPad app based on Esri’s software as a service (SAAS) solution ArcGIS Online. Spark's D2D sales teams now have mobile access to geo-referenced Spark customer records overlaid on digital maps. This has resulted in increased productivity, more sales and a richer data set for future Spark marketing and sales initiatives. Spark's door-to-door (D2D) sales teams are more productive, their sales revenues are up and Spark's analysts have a much richer dataset with which to plan new campaigns, thanks to a text-book implementation of ArcGIS Online in partnership with Eagle Technology, Esri’s official distributor in New Zealand. "Our D2D sales teams have more confidence as they knock on a prospect’s door," says Stephen Usmar, Geographic Information Specialist, Retail Marketing, at Spark. "As a result, we have seen an increase in both the number of high-value contacts made per rep per shift as well as a significant boost in total sales. The project has been so successful that corporate have asked us to expand the programme to cover commercial sales initiatives as well." It’s a far cry from the paper map-based system that Spark had been using. "In the past, D2D team leaders would take paper street maps, outline the day’s target area with a felt-tip pen and send off the sales reps," explains Usmar. "They had no idea if the household was a Spark customer or not and, if they were, which Spark products and services they subscribed to. It was hit or miss." "Then one day a Spark D2D rep called in at my house…the sales person had no information on my Spark account what-so-ever. Hold on, I thought, we have complete customer records all geo-coded as part of our service support initiatives. Why can’t we put that information in the hands of the sales reps as they make the rounds? So I spoke with Graeme Henderson, our Eagle Technology Account Manager, and he immediately recommended that we look at ArcGIS Online." "Stephen’s request was made-to-order for ArcGIS Online," says Eagle’s Graeme Henderson. "He had a clear vision of what was required; clean, geo-coded data and the technical skills to bring the pieces together into a user-friendly solution. The actual development of the solution went very quickly for a project of this scale. After configuring an initial prototype the production application project took around 2 months to complete and then within ten weeks all the D2D crews had been trained and the capability was rolled out nation-wide." "The process was really quite simple," explains Usmar. "We displayed a symbol for every household on each street in the target area. Spark customers with broadband were marked with a red box…this meant that our sales reps could skip that house. Spark customers without broadband were denoted with a blue box. These were high value prospects. And those addresses without a Spark subscriber were assigned a green box. The D2D people were trained to ask about their current provider, their telecommunications requirements and encourage them to switch. "This approach has been very successful. Skipping Spark broadband households means that each sales team can cover more territory during a typical six hour shift. Having customer details for Spark households empowered the D2D team members to up-sell and cross-sell with confidence. The success rate for sales jumped immediately after deployment. Also, having non-Spark household usage patterns and competitor information in our master database is helping us plan new strategies and pinpoint prospects for future promotions." 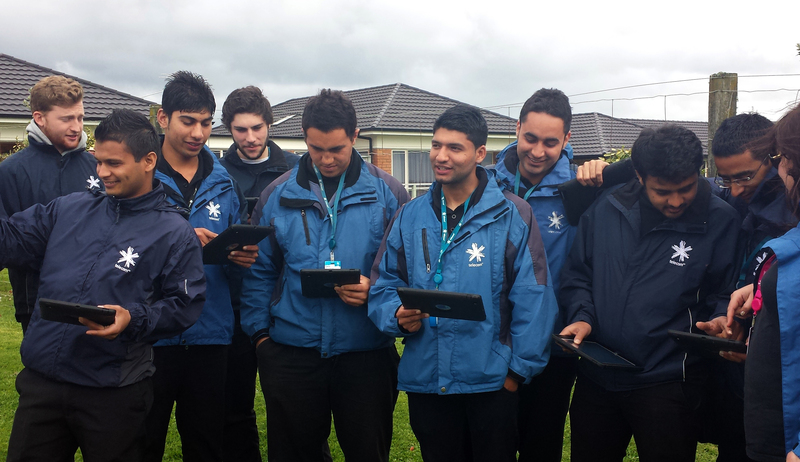 With ArcGIS Online running as an app on their iPads, the D2D teams have been quick to realise the benefits. "They love it" says Usmar, "We added a few other useful features, like links to the complete range of Spark products and services for up- and cross-selling. We also added features such as an online calculator, email and other value-add applications to keep the D2D teams connected during the day." From a return on investment perspective, the project has been a great success. "A major plus for us is that we didn’t have to involve our internal IT team or, other than purchasing iPads for the field teams, or add much infrastructure," notes Usmar. "ArcGIS Online is cloud-based which means we don’t have to worry about software installation or upgrades, scaling up or down or any support issues." The success of the project means that Spark will be expanding their engagement. "We’ll be using the data to help us better manage our D2D teams," says Usmar. "Plus we’ll be overlaying socio-economic data on top of our route maps for predictive analytics for tighter targeting for promotions. And, as we said before, we’ll be using a similar approach for contacting commercial prospects." "We have gone from paper-based to digital quickly and easily," concludes Usmar. "Eagle Technology’s advice and assistance has been instrumental in the success of the programme. We expect to continue to reap the benefits of ArcGIS Online’s mobile geo-spatial technology."